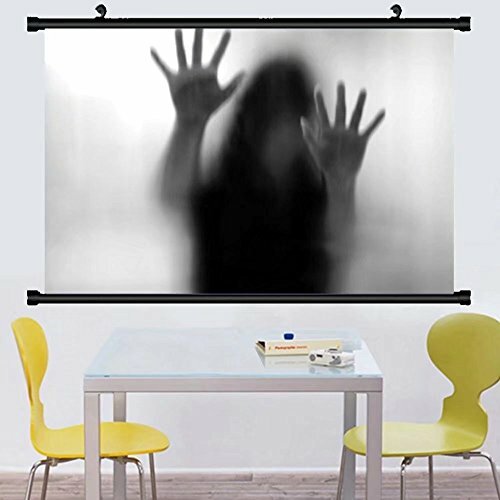 Gzhihine Wall Scroll Horror House Decor Silhouette of Woman behind the Veil Scared to Death Obscured Paranormal Photo Wall Hanging Gray 35"x24"
This is a mural made of satin cloth.This is made entirely by hand and printing. Add a unique feel to your room with this elastic fabric handmade wall hanging. Go for a dramatic makeover of your wall. It adds a lot of color in any given room and spreads a very positive and joyous vibe. Care: Dry Cleaning Or Cold Water Wash, Hang to dry. Vivid colors.Highly unique. Versatile.Durable enough for both indoor and outdoor use. We do our best to provide an accurate description and realistic pictures. Once there is any problem, please contact me directly,We will help you within 24H. If you have any questions about this product by Gzhihine, contact us by completing and submitting the form below. If you are looking for a specif part number, please include it with your message.